Step I: Make the number of decimal places even by affixing a zero on the extreme right of the decimal part (if required). Step II: In the integral part, mark the periods as done while finding the square root of a perfect square of some natural number. 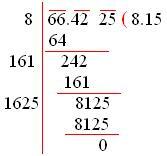 Step III: In the decimal part, mark the periods on every pair of digits beginning with the first decimal place. Step IV: Now, find the square root by long division method. Step V: Put the decimal point in the square root as soon as the integral part is exhausted.